After the success of this year’s breeding season, it’s with mixed feeling that I’m introducing you to the class of 2018. 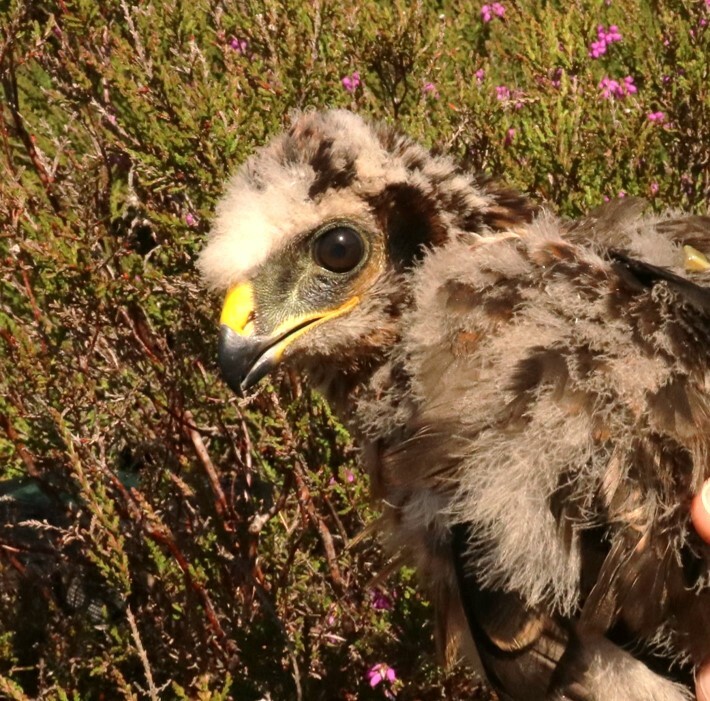 You will have seen from our last blog post that we’ve already lost three of our 2018 tagged hen harriers in suspicious circumstances. We hope that the rest of this year’s cohort manage to survive a little longer. 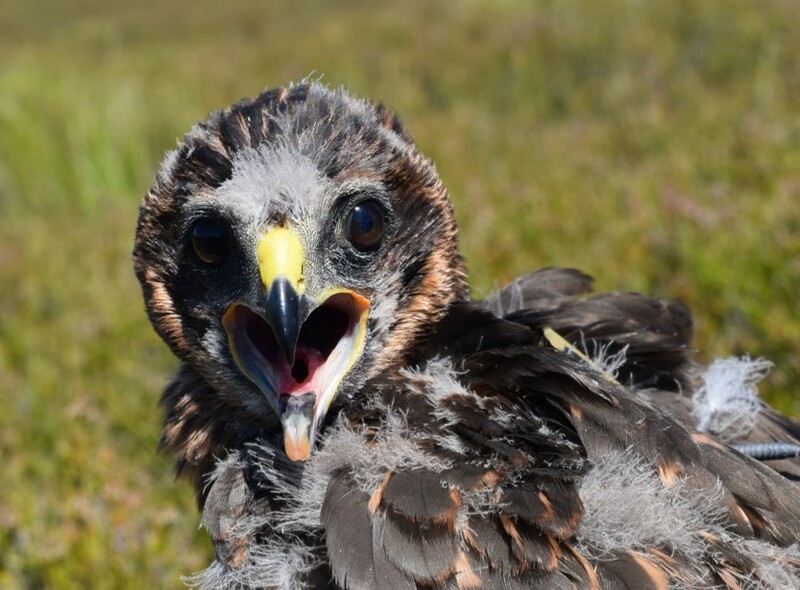 Hen harriers are one of the UK’s most persecuted birds of prey, and the breeding population in England is dangerously low with just nine successful nests this summer despite habitat for over 300 pairs. Fitting tags helps us learn more about the risks they face. We’re now crossing our fingers as we watch these young birds go out into the world. For now, we’d like to introduce you to twelve of them. This year we incorporated a couple of themes into the naming process. Some have been named after gods and goddesses, others pay homage to notable people, while some celebrate their national language and landscape. Thoth is a male chick tagged in the Scottish borders in 2018, named after the Egyptian god with the head of an ibis. 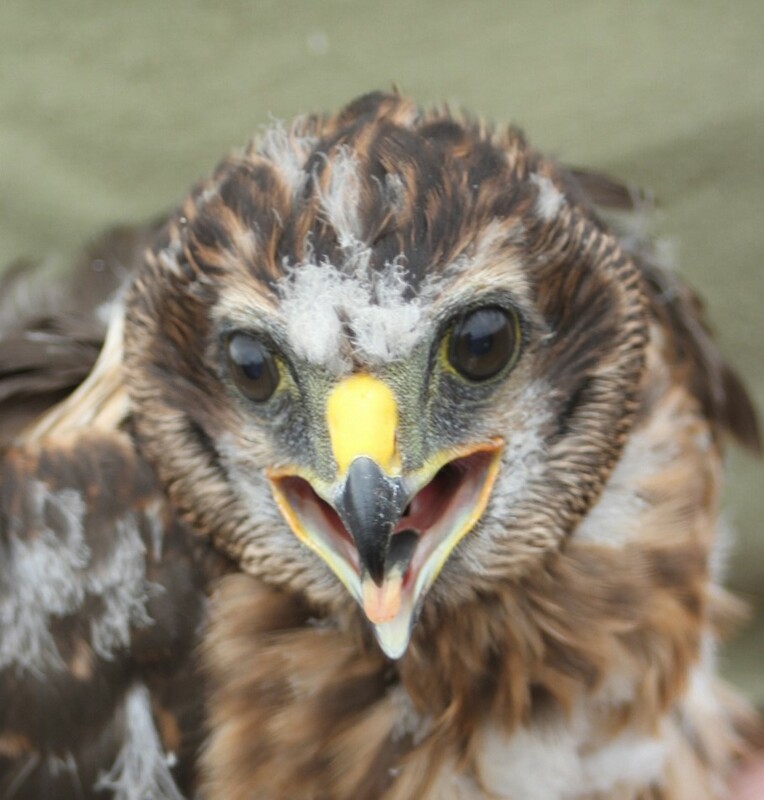 His tag was sponsored by Scottish Borders Council to learn more about hen harrier movements in the Scottish borders. 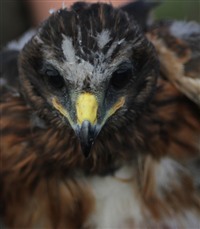 Vulcan is a male chick tagged in Northumberland, and came from a nest of five chicks. His father is colour ringed and is from Langholm. He’s a favourite of our project team member Jack, and named after the Roman god of fire. 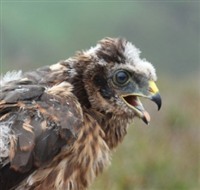 Rain was tagged at Bowland, and came from a nest of five chicks. 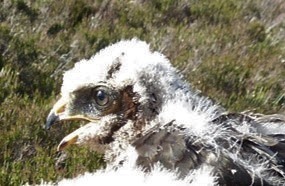 She’s one of the first hen harriers chicks to be successfully raised in Bowland since 2015. Nyx was tagged at Bowland from a nest of five chicks and is one of the 13 birds to successfully fledge at Bowland this year. He is named after Nyx, the shape-shifting water spirit. One of a brood four, and the first of our chicks to be tagged this year. Thor was named after the famous god of thunder and was tagged on a nest at Bowland in collaboration with United Utilities estates. Doona is a female chick tagged on Isle of Man, named by Dhoon School. 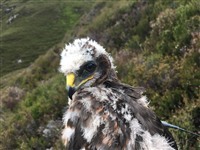 Her name means ‘dark maiden’ and she was tagged in collaboration with Manx Birdlife. 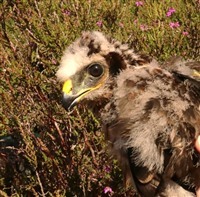 Arthur is a male chick tagged at the National Trust’s High Peak Moors. He is named after Arthur Hobhouse, who set out the philosophy behind our system of National Parks of England and Wales. Hobhouse argued that everyone should have access to fresh air and beautiful places. 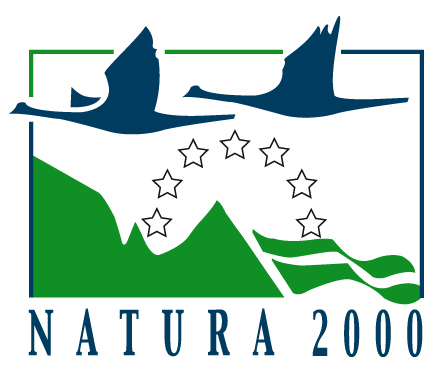 2019 marks the 70th anniversary of the National Parks and Access to the Countryside Act 1949. 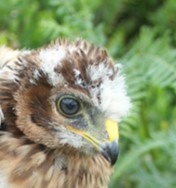 Arthur will be monitored in collaboration with raptor workers and the National Trust. 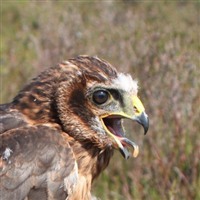 Keen is a female bird tagged in Perthshire from a nest of three chicks. She is the third bird to be tagged in an area of woodland managed sustainably by the community for the benefit of everyone, after DeeCee in 2016 and Heather in 2017. 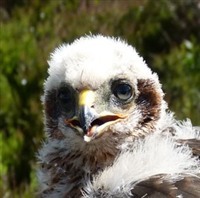 Marci is a female chick and the third bird to be tagged at Mar Lodge, one of several chicks born there in 2018. Harriet and Calluna were also tagged there in 2016 and 2017 respectively. Hilma was a female chick tagged at a nest on Forestry Commission Scotland-owned land in the Scottish Borders, and a sister to Thoth. 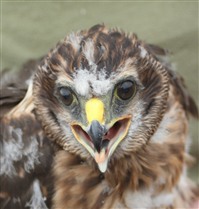 Her tag was sponsored by the Scottish Borders Council to learn more about the movements of hen harriers in the borders. However, Hilma didn't travel very far. After she left her nest, she moved south into Northumberland. Her tag was transmitting regularly when it suddenly and inexplicably stopped. Her last known fix on 8 August showed she was near Wooler, Northumberland over land managed for driven grouse shooting. Hilma is the second tagged hen harrier to disappear in Northumberland in the past year, after we reported on the disappearance of Manu in October 2017, closely followed by his brother Marc in Cumbria in February 2018. Heulwen was a female chick tagged in Gwynedd in North Wales. Her name was chosen because it means ‘sunny’ in Welsh. After she left her nest, Heulwen travelled through north Wales, across Snowdonia and eastwards towards Wrexham. Her satellite tag was transmitting regularly untili it suddenly and inexplicably stopped. Her last known fix on 29 August shows she was in the vicinity of Ruabon Mountain. Heulwen was not far from where Aalin, one of our 2016 tagged bird cohort, went missing on 9 February 2018. Octavia is a female chick tagged at the National Trust’s High Peak Moors from the first successful nest in the Peak District since 2014. She was named after Octavia Hill, one of the three founders of the National Trust. 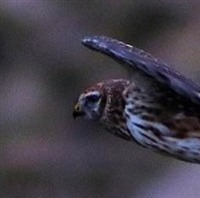 On the 22 August she moved onto privately-owned driven grouse moors near Sheffield. Her tag was transmitting regularly when it suddenly and inexplicably stopped. Her last known fix on 26 August showed she was over an area of land managed for driven grouse shooting at Broomhead. Are you tracking any south of Sheffield I spotted one yesterday with a sat tag on...sent an email to Hen Harrier.